BREED & GROW NEW FORMULA! Superior nutrition for breeding horses and young stock. The only breeding supplement/feed to use a high level of nucleotides effective in promoting correct development especially in utero. ~ now includes a toxin binder! Please note a 1 month supply bag is a 2 month supply for a foal or weanling! PLEASE NOTE IF YOU ARE PURCHASING ON A MOBILE DEVICE, CLICK THE SMALL ARROW TOP RIGHT OF YOUR SCREEN FOR THE PRICES AND PURCHASING SELECTION. Supplementation is superior to feeding a breeding premix! Whether you own a breeding stallion, mare in foal or weanlings, this formula is specifically designed for reproduction demands and the high growth rates of youngstock 0-2 years. 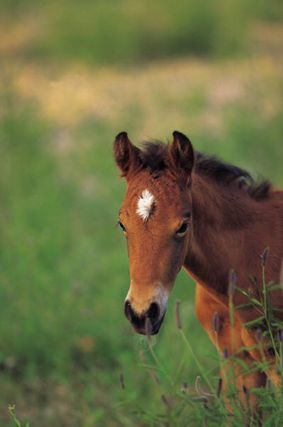 The nutrition requirements for reproductive horses are considerably different from working or spelling horses and should be catered for separately. Why feed a supplement rather than a premix designed for Breeding or Growing horses? Firstly, different horses require different feed quantities. How much you feed a horse depends on how many calories it requires and this can vary wildly between a well covered broodmare, thoroughbred yearling, a creep feeding weanling and a mare due to be served. Some horses need more feeding than others but the nutrients and mineral requirements are the same. Not all horses will be getting the maximum feed required to get the required nutrition they need. Many premixed products try to deliver both calories and nutrition in one product but the concept is flawed as some horses get too much and some not enough of the nutrients they need to correctly support a developing foal. The benefits of feeding a top quality supplement mean that you can feed more simply and cheaply, and easily increase or decrease the feed component as required, without compromising the nutritional content the horse is receiving. The other important factor, is that most premixes don't contain high quality organic minerals and ingredients, and whilst some do use some organics, they are not used exclusively, meaning you have the potential for imbalances and differences in absorption rates. Also when you weigh up the cost, often it is cheaper to feed a supplement and keep the feeding simple. Breed & Grow comes in a 1.8kg or 5.6kg foil pack. Yearlings only require a half dose of Breed & Grow. Broodmares in foal require a full dose, and young stock from 2-3 years 3/4 of a full dose. 1 ~ Important minerals for breeding demands, and the development of fast growing and specific tissues. All minerals are in organic proteinate form. 2 ~ Toxin binder to protect your horses fertility against the effects of mycotoxin exposure. 3 ~ Organic selenium - indicated in optimising fertility rates and development. 4 ~ Immune Boost ~ absorbs pathogens, and helps promote the transfer of nutrients across the placenta. 5 ~ Functional proteins designed for in utero development and fast developing specific tissues.